For anyone who reaches for a pen and paper to take notes, reaching for an iPad app like Notability is already an adjustment, let alone a Mac, which of course doesn't even have a touchscreen. On iOS, Notability is a popular and elegant note-taking app with an ink-first mentality. Now it's on the Mac, promising to bring that same design sense to the desktop and sync up all your notes with iCloud—and it largely succeeds. 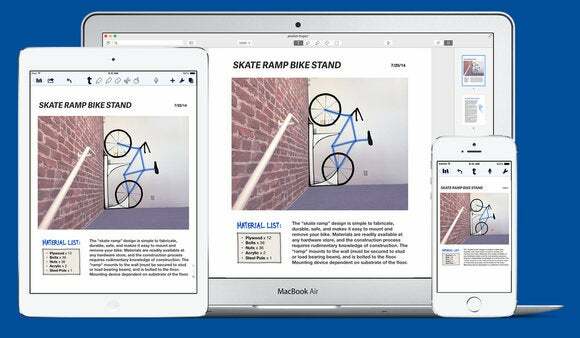 Though with free, note-taking powerhouses like Evernote and OneNote out there, is Notability worth your $10? The short answer is it depends. If you are a die-hard Notability user on iOS—and especially if it's your go-to notetaking tool on an iPad—having all of your content available on the Mac will be well worth it. Add in images or write many different types of pen input. 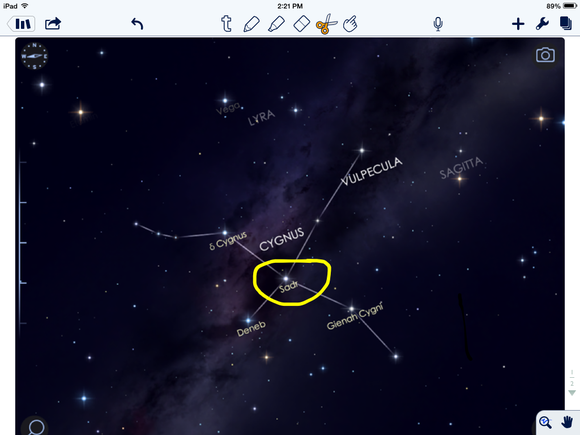 The app will also appeal to users who connect a pen stylus to their Mac for drawing or note-taking. It handles writing, drawing, and marking up content very well. For the rest of us who stick to a trackpad or mouse, Notability's inking possibilities will still be useful for highlighting and marking up content, with several choices for the pen color and width. Of course you can also type, with sufficient font options for a note-taking app. Notability is really designed to do both in tandem, along with the ability to record audio for an all-in-one digital notebook. Each note is pretty much a blank canvas—just click and start inking or typing (although you can't insert text on top of an image). You can drag-and-drop an image, screenshot, or any other file type that you want to ink over. Notes that you create on your Mac sync to any iOS device through iCloud. You can organize notes into subjects, which get assigned a color code to make it easier to glance at (unfortunately you can't change the colors). Throw a divider in between some of them to clean up the interface. The iCloud integration works really well—notes that were created on the desktop appeared rapidly on an iPad, and vice versa. I found if you already have the iOS app you should be sure you have turned on iCloud syncing in order to get your notes to start showing up on the Mac. Mine was turned off, but once I flipped it on they showed up right away. For extra backup you can save your notes to a third party service: Dropbox, Google Drive, Box, and WebDAV servers are supported. This will save the notes as a PDF so you can import them elsewhere. Voice recording works really well, too. Just click the microphone and start recording. When in the same note you can hit "record" again after ending a session and the audio will record after the first one - a nice feature if you are recording a Comcast customer service call and want to wait while on hold. The search capability is not as strong as something like Evernote, which will find text inside of images. Yet it will find text anywhere in your notess, highlighting the words inside them so they pop out on the screen for easy viewing. While the design and connection to iCloud are great, Notability has a few bugs that need to be squished. 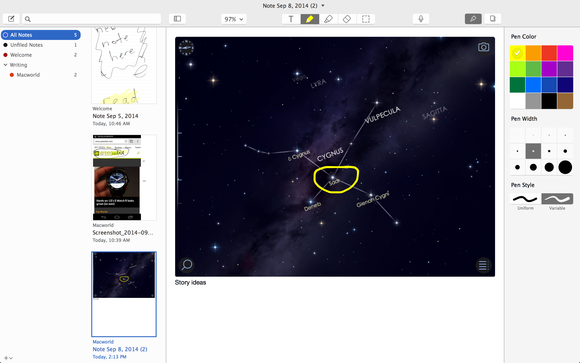 Notability pulls a disappearing act when minimized. One weird quirk is when it's in full screen mode. When swiping to Notablity from another app the screen hesitates for a moment and then skips over to the desktop. I found I needed to take it out of full-screen mode for a more stable experience. 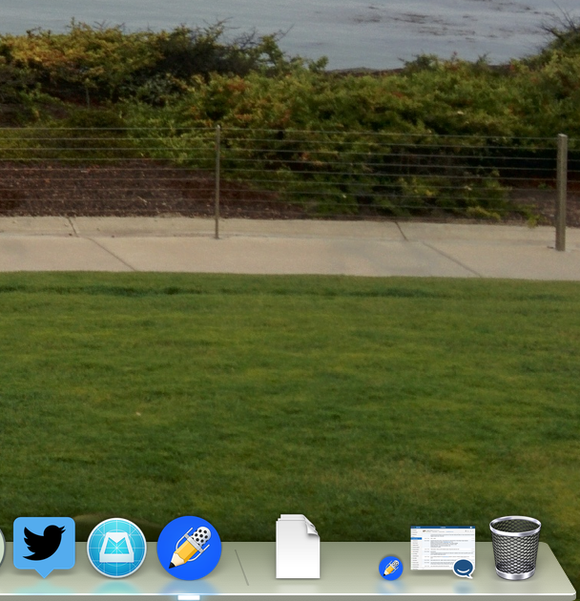 Also, when minimizing Notability to the Dock the preview image disappeared, leaving only the icon. It was more of a nuisance than a usability issue, but was still rather odd. A possible cause could be that Notability is coded for the future, as the familiar three buttons feature the translucent look of OS X Yosemite. Right now $10 is a lot to ask for a note-taking app when there are good, free alternatives and a few bugs that need to be worked out. However, Ginger Labs has a good track record with its iOS version and is likely to get those resolved. So if you have been using it considerably on mobile, it makes sense to make the leap and get the desktop version. The Mac version is a no-brainer if you're invested in Notability on iOS. But with so many free note-taking apps, $10 is a hard sell. Plenty of ways to sync your notes between devices.